The 26.2 miles from small town of Hopkinton, MA to Boylston St in Boston is the most iconic marathon race in the world. The communities that line the course come together to create an atmosphere like no other. The unrelenting course and the unpredictable weather create a unique element of unknown. The runners have earned their spot on the start line, all owning that coveted BQ. Just getting to that start line on April 15th is a journey worth telling for each of the 30,000+ runners. Race day is a celebration of these runners, the communities, this race. 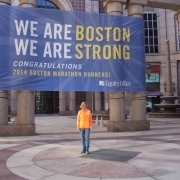 We asked runners on our team to share a few words about their journey to Boston and what the race means to them. 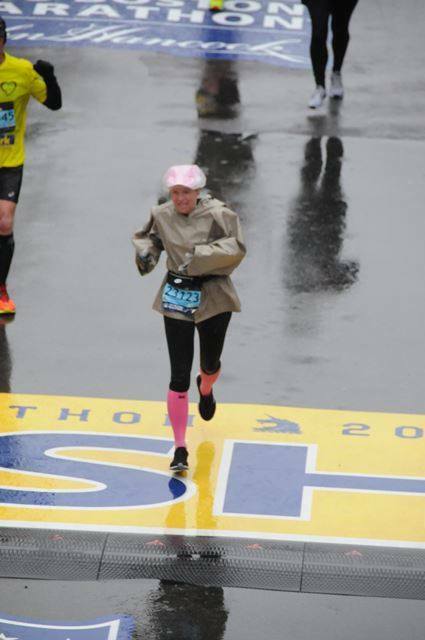 Sandra S. has experienced the full spectrum that is the Boston Marathon. We have loved being part of her journey, and we think you will love reading about it just as much as we have. How many times have you raced Boston? 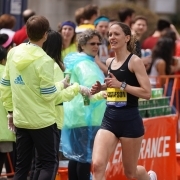 I have raced Boston 5 times consecutively – this is my 6th Boston and 29th marathon. What does racing Boston mean to you? I was at the finish line in 2013 (as a spectator) when the bombs went off and after the dust settled, I vowed to return every year that I qualified. This year will be my 6th, my husband’s 7th and it also marks the anniversary date of the bombs – April 15th. I was a relatively new runner in April 2013, but had just qualified for Boston in my first marathon a few months earlier (November 2012). My qualifying time was for the next year in 2014 so I was soaking everything in. I was like a kid in a candy shop overseeing all the festivities and watching the race. There was so much positive energy and buzz. The entire city was focussed on the runners. I still remember the Boston local commentators on the local station wanting to know who that Robin Watson from Canada was. It was hysterical as they were somewhat stumped that he was leading and had to go and get information to share with the viewers. It was cute and I didn’t really know who he was either, but myself and my friend were cheering him on. We splurged to stay at the Lennox hotel and had a room overlooking the finish line, which sadly also provided a panoramic view of the finish line bomb. My husband was out in the streets when the bomb went off and the police forced me to stay in the hotel. However, about 10 minutes later, we were told that the threat required us to evacuate ASAP. I eventually found my husband as I was being evacuated by the police. He was still in his running gear, without a change of clothes and we had no passports. We walked for hours, helping other runners and people like ourselves who were lost in the streets. We tried to seek refuge in a few locations, but each time we were ordered to clear out if we were not a Boston resident. It was getting very cold and people like ourselves were scrambling for a place to go. Eventually, we learned we could not return to the Lennox Hotel and so we walked to find another hotel (keep in mind that my husband had just run the marathon and was still in his running clothes). I had received many invites from many Bostonians who offered us a place to stay. Eventually, I received an iMessage (via Wifi… there was no cell service) that a friend of ours had secured a hotel room at the other end of the city. Hence, we walked there (another hour) where my husband could eventually shower and put on his stinky clothes again. We reached out to the Canadian Consulate office, and the next day we were able to get back into the Lennox hotel to retrieve our passports and belongings. At that point, the hotel had become the FBI headquarters. We spoke with them, gave them our photos as well as videos as much of the focus of the FBI shifted to sifting through social media posts, photos and videos. It was quite surreal. Each year since then, at least one of our kids has joined us for the weekend. Last year, we had a small family group that ran the 5km together. Do you have any goals for the 2019 race? I just keep showing up healthy, fit and ready to take on its challenge. The rest is out of my hands as we learned last year with the weather. Although I am not fast, I am consistent in my performances and I take the long-range approach. I hope to still be running in my 80s (lol). I subscribe to the theory that running is a lifetime commitment and a necessary part of my daily routine and ideally, I would like to keep going back to run Boston as long as I am able. I have a very demanding job, travel constantly and spend a lot of time alone. Running is that vice that helps me maintain a necessary balance in life. We have 4 married children and are anxiously awaiting grandchildren. I had a bit of a health scare earlier this year with my heart, so although I love to race a lot, I do so for fun and very conservatively. work schedule and gives me workouts to keep me honest and focussed no matter where I am. We plan around my weekly travel days, the snow, and access to treadmills. As long as I can keep balancing it all, I’ll be able to keep running. 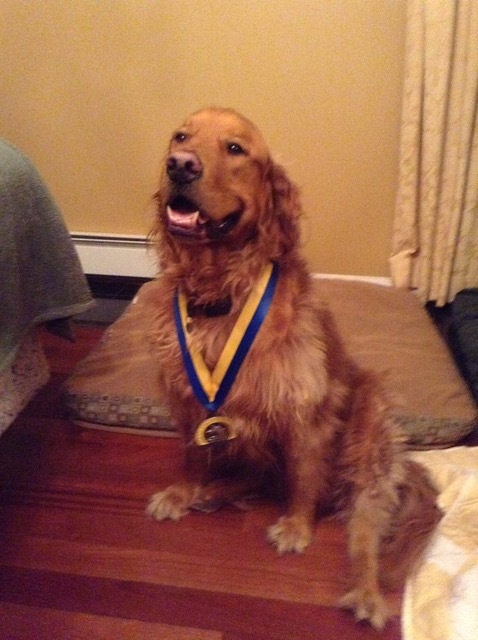 When we reached out to Sandra she attached a photo of her dog, who trained with her for 4 of the 6 Boston Marathon’s she has run.